You will earn 237 Reward Points. Earn 1 reward point for every 1 dollar spent. 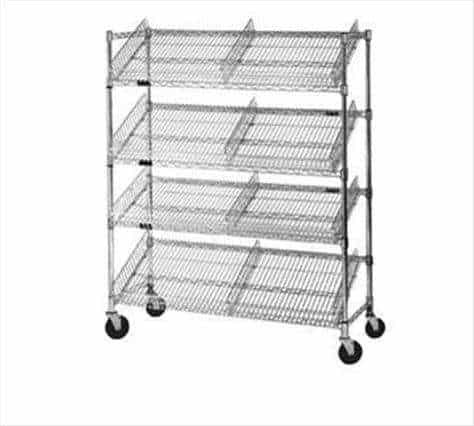 The Eagle M1824V-4 Angled Shelf/Visual Merchandising Cart features (4) reversible wire shelves with an adjustable angle, (3)-sided truss reinforcement braces at the top and bottom, (4) steel posts grooved at 1" increments, (4) 5" casters (two braked), and a 3-1/2" donut bumper. This unit has a VALU-MASTER pewter gray epoxy finish, and measures 24"W x 18"D x 72"H.